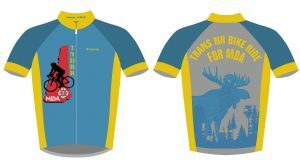 In our desire to raise more money for MDA we have designed and are offering for sale, cycling jerseys that are completely different than our ride premiums. Pre-order now to reserve your jersey for $75. A limited number of jerseys will be available at the ride for $90. Click here for Size Chart.